November 23, 2013 - Make sure you like EcoJoes on Facebook to stay updated on green ways to save money and help the environment. Just click the "like" button below. Muchas gracias! If you’re like most hu-mon beings, you enjoy hydrating yourself with H20, AKA “the big wet”, “liquid ice”, “loosey goosey”, or “water”. How should the eco-friendly individual obtain said water, though? Bottled water is expensive, causes a huge amount of waste from packaging and transportation (although you can do some cool stuff with the old water bottles), and, according to this Duke University webpage, might not be as safe as tap water. I’m down with drinking str8 from tha tap, but lots o’ people prefer to filter it. 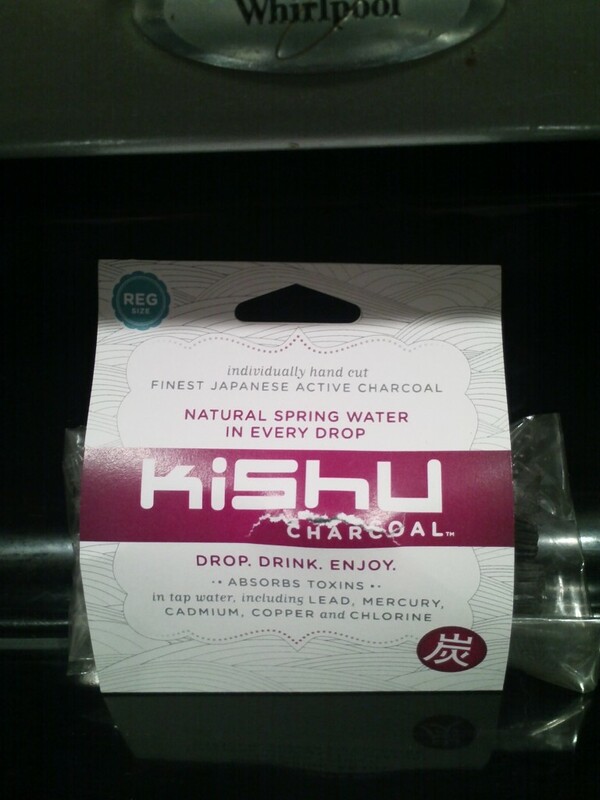 If you’re one of these people, and you’re looking for a greener way to filter water than by using a plastic filter, might I be so bold as to suggest Kishu charcoal? The founder, Judith Bershof, started this company in 2011 when she was looking for a more environmentally friendly alternative to plastic water filters. From its minimal packaging (which cuts down on waste), and the fact that you can compost the filter when you’re done, I’d say they’ve done a good job keeping this product green. Kishu charcoal claims to be made from sustainably harvested tree branches, and can be used for 4 months. You just have to boil it every month to keep its pores open. Another great eco-friendly thing is that after 4 months have passed, you can reuse your old charcoal filter by using it in your fridge to absord odors, or by crushing it up and mixing it into your garden soil to improve water absorption. Pretty dang cool. 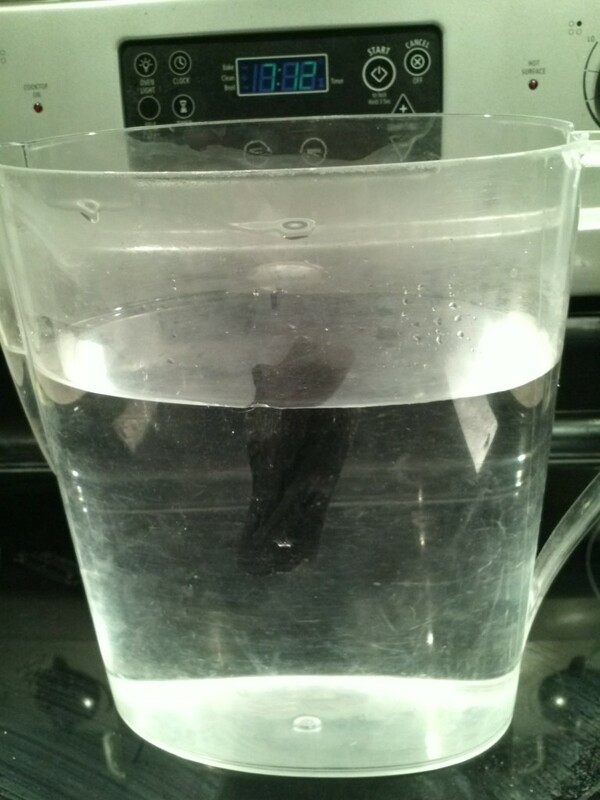 I chucked a piece of Kishu charcoal into a pitcher o’ water, and left it overnight. I’d been worried that the charcoal would cloud up the water, but it’s very smooth and not flaky, so the water stayed clear as glass. A day later, my woman and I deigned to taste this water. Verily, it was crisp and cool as the waterfalls of Norway, with a very pleasing taste. A single tear running down my cheek, I hefted an approving thumbs up to Kishu charcoal, the green way to filter your water. Posted in reusing, water	on Saturday, November 23rd, 2013 at 11:01 AM. Allmost every one of us have been benefited with the uses of activated carbon unknowingly, as it plays key role in water purification, and improving air quality, apart from fulfilling the medicinal and industrial needs. Thanks for sharing this information. Clean water is very essential for a healthy living and water purification is a very topical issue. Using natural products for this purpose is great.